The committee will be established in May and will be tasked with resolving problems between businesses and with consumers on both sides of the border and internationally. 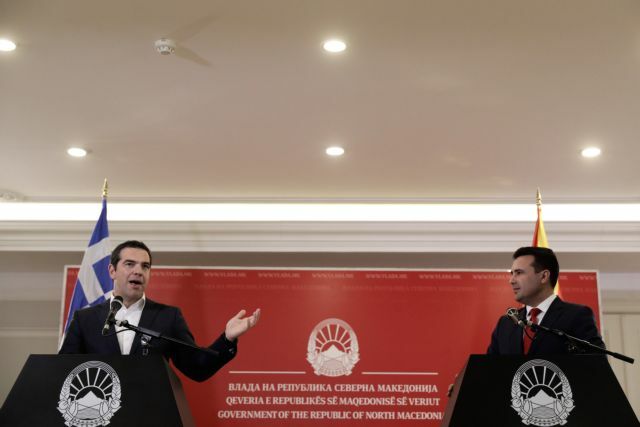 Joint press conference by the Prime Minister of North Macedonia Zoran Zaev and his Greek counterpart, Alexis Tsipras, at the Government Building in Skopje, Republic of North Macedonia on April 2, 2019. / Κοινή συνέντευξη τύπου πρωθυπουργού της Βόρειας Μακεδονίας Ζόραν Ζάεφ και του Έλληνα ομολόγου του, Αλέξη Τσίπρα, στο κυβερνητικό μέγαρο, Σκόπια, Βόρεια Μακεδονία, 2 Απριλίου 2019. 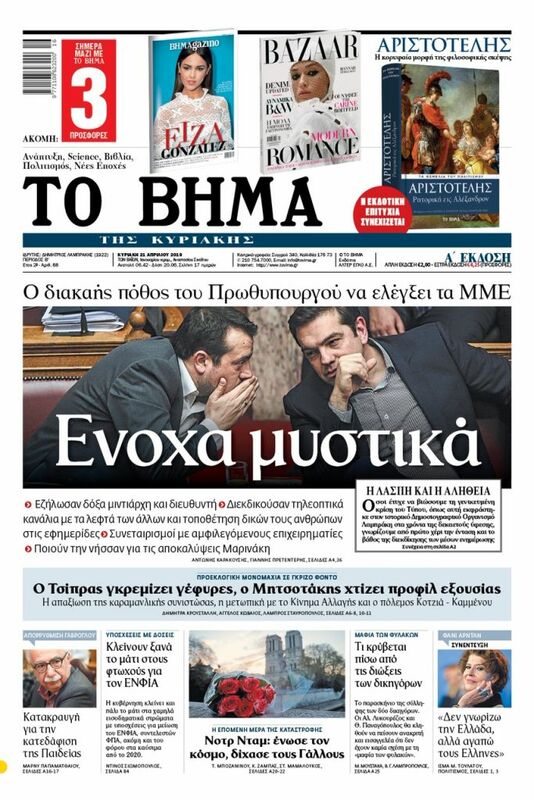 Amidst a flurry of Greek press reports criticising the ambiguities and potential traps of the Greece-North Macedonia Prespa Agreement, PM Alexis Tsipras and his North Macedonian counterpart Zoran Zaev attempted to allay fears regarding the use of the brand “Macedonian” by both sides, announcing a joint committee to review the related issues at a joint press conference today. Tsipras’ visit was the first by a sitting Prime Minister to Greece’s northern neighbour and the international press welcomed it as “historic”. Tsipras dismissed the negative Greek press reports and the criticism of main opposition New Democracy as “hypocrisy and fake news”, and he maintained that the accord effectively addresses problems that have festered for 30 years. “Both in North Macedonia and in Greece we are confronted by the phenomenon of fake news. In Greece, they suddenly discovered that problems exist. They have existed for the last 30 years, and this agreement resolves them,” Tsipras said. “The Prespa Agreement provides the method for resolving open issues such as that of commercial brands. The agreement provides for the creation of a task force that will be called upon to thrash out these issues. We have some people in Greek Macedonia who do not support the Prespa Agreement but who for many years traded here [in North Macedonia]. They are hypocrites,” the PM declared. For his part, Zaev noted that the committee that will hammer out agreements will have three years to complete their task. It is unclear how bilateral or international disputes regarding the Macedonian brand name will be handled, and if there will some type of arbitration. Under the terms of the Prespa Accord, the two countries have undertaken to urge their business communities to engage in a structured, good faith dialogue in order to reach mutually acceptable solutions to problems pertaining to trademarks and brand names at both the bilateral and international levels. The dialogue will be held between experts from both sides in the EU framework and with the assistance of the UN and the International Organisation for Standardisation. The task force must be formed within 2019 and will have three years to complete its work. New Democracy leader Kyriakos Mitsotakis (whose party vehemently opposed the Prespa Accord) told business leaders in Thessaloniki recently that there is no adequate framework for the protection of products from the northern Greek province of Macedonia. “It behooves us all to create a comprehensive strategy to temper the negative consequences of the Prespa Agreement, at least in terms of the economic aspects,” Mitsotakis said. “The speed and shoddiness with which the Prespa Agreement was signed and ratified created a series of problems that have to do with the management of the brand “Macedonia” and which were kicked down the road. The problems emanate from Article 7 of the Agreement, which allows the use of the name “Macedonia” for products,” Mitsotakis said.